Zeke made his way down the dark stairway leading to Battery A. He did his inspections each day but today he’d forgotten his lantern. The window of light at the bottom of the stairs got larger. At the bottom, he snaked his way through the twist of corridors and emerged back into the crisp New England morning. The main fortress of Fort Knox loomed over him from the top of the hill. He stood and looked across the river to Verona Island. 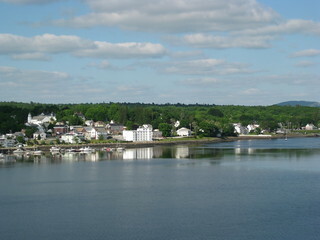 To his left, Bucksport sat on the opposite bank where the two forks of the Penobscot river merged. Steeples of the Baptist and Methodist churches escaped the roofline of the town. Zeke shook the day-dreams from his head. He walked the line of Rodham cannons. He checked for obstructions in the barrels and the ratcheting systems that adjusted elevation. After inspecting each of the 32 guns, he verified all the powder was accounted for in the magazine. All was in order. He turned to go back, when a chipmunk caught his attention. It ran from the tall grass on the hill into the firebox of the hot shot furnace. He’d likely made a nice home for himself in there, Zeke thought. At least someone was making use of the furnace. Soldiers built it about thirty years before. It heated cannonballs so that on impact they would catch wooden ships on fire. When construction concluded about 20 years ago, ironclads had replaced the older sailing ships and made the furnaces obsolete. Zeke walked back up the stairs. At least he didn’t need to inspect Battery B. It also had a dark stairway but no guns. The Army ran out of money so they put the remaining guns where they could best be used. He walked through the main gate and shielded his eyes from the sun glinting off the windows across the parade grounds. Those windows looked into the enlisted men’s quarters and the bakery. If a soldier wanted to get to his quarters, he had to go through the bakery and pray his bunk wasn’t in the last room in the row. Zeke had his bunk in the officer’s quarters. He felt safe since he was the only person stationed at Fort Knox. Embers replaced the small fire he had started earlier that morning. He picked up the coffee pot and poured himself another cup. He stood looking out at the parade grounds. He still needed to check the guns in the main fortress. That would take an hour. As he sipped his coffee, he pulled out his pocket watch. Nine o’clock. He could pull out his banjo and pick a couple of songs. Able, his cow, and the chickens seemed to enjoy his playing. His rifle needed cleaning. He also needed to split some firewood. About 3 o’clock, Zeke finished all his inspections and the items on his list. He went back to his barrack and picked up his Bible. The pastor in Bucksport had preached the last few months on John and the book of Revelation. Zeke wanted to read ahead. It would take several readings to wrap his head around it all. Some days he thought old John had gone crazy out on Patmos. Zeke could identify. There were days, he felt as though he had been exiled. There were two big differences he and John: Bucksport was just across the river and Zeke had enough firepower to turn Patmos into a pile of pebbles. Zeke sat with his feet dangling over the top of the fortress wall. He watched the occasional ship move up the river and enjoyed the stillness. It helped him as he prayed. If his mind wandered he could look at the river, the trees or the granite cliffs and a psalm would come to mind. Eventually the sun began to sink below the cliffs behind the fort. Zeke stood and walked down the spiral staircase. Clouds were rolling in and a cold breeze made Zeke shiver. He added some kindling to the embers and after it caught he added a few pieces of wood. He went about making dinner, a couple of eggs and some cured ham. For dessert he had a generous helping of wild strawberries he picked a few days before. After dinner, he placed his chair by the fire and pulled out a book of poems by Longfellow. Zeke met Longfellow and his sister, Anne Longfellow Pierce at a dinner party in Portland a few years ago. Zeke found one of his favorites and read it although he could recite it by heart. O star of strength! I see thee stand And smile upon my pain; Thou beckonest with thy mailed hand, And I am strong again. As he read, a small pit formed in his stomach. It was the seed of melancholy wanting to take root and he needed to weed it out before it overran his heart. He closed the book and stared into the fire. He sat there for a long time and began to pray, “For the Lord is good, his steadfast love endures forever and his faithfulness to all generations.” He fell silent again, stood, and got ready for bed. Early the next morning, Zeke awoke to the sound of thunder and rain splattering on the granite arches and walkways. He rolled over to try and go back to sleep but it was no use. He got up, dressed and started a fire. With the rain, it would be a good opportunity to inspect the “Alley” for leaks. Plus he could get some exercise by making a couple of laps. The fort was made of two rings divided by a ditch. Any enemy that scrambled over the top would land in the ditch with rifle fire from both sides. Zeke lit a lantern and made his way across the ditch and into the Alley. The only light came from his lantern and the rifle slits. The roof hung low and the echo from his boots traveled the length of the corridor. He hated the alley. Sometimes he half expected something to jump out at the end of each corridor. And the thought of being stuck in here during a land attack. 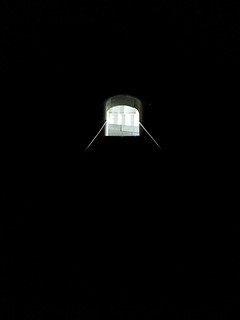 Once the doors were shut to the alley, there was no way for those in the Alley to reach the rest of the fortress. So soldiers would be stuck in the dank, dark hole till the end of the attack. On top of that, the alley was completely useless. Invaders only needed a few ladders to span the ditch and they would be out of the range of the rifle slits and inside the fortress. So much of this place made no sense to Zeke. The fort was originally built for one type of cannon but halfway through construction, they changed the type of cannons they would use. This required the builders to rework the gun emplacements. There was Battery B. It faced Bucksport. If the Army had placed guns there, it would only take one errant shot and instead of striking an enemy vessel, the cannon shot would decimate the Methodist church or the Mayor’s house. The big 15” Rodhams required twelve men to load the 400 pound shells. To have all the all guns firing at once would require over 1,600 men. The barracks could only accommodate around 300. All this folly culminated with his assignment. One man for this entire fort. What would happen if someone did attack? He couldn’t fire any of the cannons by himself. All he could do was lock the gates and hope no one made it inside. Zeke finished his laps and went back to his barrack. He grabbed a bucket and went to the cistern. Once he had water, he put the enamel pot for coffee on the coals and another one for his oatmeal. Once the oatmeal was ready he threw in some strawberries. While he ate he thought about his day. He could do some woodworking. He had turned the second floor of the officer’s quarters into his workshop. Zeke was making a rocking chair for the pastor who mentioned he used to have one back in Massachusetts. After cleaning up from breakfast, Zeke headed to his workshop. He needed to start on the rockers. He found two pieces of spruce and attached them to his work table with a clamp. Zeke found his drawknife on the other table and began putting a curved edge on the rockers. He finished one end and then reoriented the wood and started on the other end. Then he switched to a rasp to even out the rough spots and then to a file to smooth everything down. He set the finished pieces down and heard his stomach rumble. He pulled his watch out. It was close to 2 o’clock. He went downstairs and made a lunch of ham and corn bread. He warmed the leftover coffee and used that to wash it all down. The rain had stopped so Zeke lighted his lantern and made his other inspections. He felt silly for doing these inspections everyday but it passed the time. Plus he didn’t want a repeat of his first year here. After three months at the fort, Zeke thought he would go crazy. He went to the wharf one morning and rowed the little Army boat over to Bucksport. When anyone asked, he told them he was on leave. He got a room at the boarding house and spent his days meeting the townsfolk and talking with the preacher. Even then he wrestled with the futility of his posting. Zeke shared with the pastor that it felt as though God had forgotten him out there at the fort. The pastor encouraged him the best he could. That’s when the preacher brought up the idea of a monthly prayer meeting at the fort. A few days later, word moved through town a ship was coming up the river flying the US flag. Zeke went out with the rest of the town to see who it was. The whole town was standing there as the ship pulled alongside the dock. Zeke noticed soldiers on deck and his blood ran cold. Major Abernathy was the first to step off. He had appointed Zeke to this post. The mayor of Bucksport stepped forward and introduced himself. 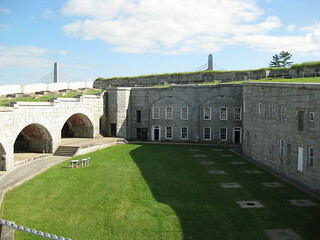 Abernathy told him they needed supplies and would make an inspection of the fort. That is when Zeke’s lie unraveled. The mayor had motioned for Zeke to join them. Abernathy greeted Zeke warmly but when they arrived back at the fort Abernathy placed him in custody and confined him to the powder magazine. Five days later he released Zeke. Abernathy told him he understood the stress of this post but if he left his post again he would be court-martialed. Zeke assured the major he understood. Zeke stepped out of the covered stairway to Battery B. He walked past the empty gun emplacements to the wharf. He found a few limbs snagged on the boat lines. The pastor and some others were coming tomorrow. He had forgotten. Tomorrow was the monthly prayer meeting. The pastor’s wife, Margaret, would bring a dish. He had lots of blueberries so he would make a cobbler. These monthly meetings were a lifesaver. Everyone arrived around 2 o’clock the next afternoon. The preacher brought a short sermon, they prayed and sang while Zeke played his banjo. But the highlight was the meal and the chats. The preacher told some of his hunting stories and caught Zeke up on the town happenings. Margaret tried to cajole Zeke into calling on a lovely unmarried parishioner, Elizabeth, on his next trip into town. George, the store keeper’s son, asked Zeke to share stories about when he fought in the War between the States. They sat for hours talking and laughing until the sun sank behind the cliffs. Then the conversations started to dwindle and everyone began packing up. Zeke walked ahead of everyone down the stairwell toward the wharf. George was the last one in the boat and took the line from Zeke. The young man sat down at the oars and began pulling once they were clear of the wharf. He nodded to Zeke who waved in return as the boat skimmed across the calm river. Once the boat blended into the background of the town, Zeke trudged back up the dark stairway. He checked on Able and walked to his barrack. He was out of sorts. His heart was bursting from the time with his friends but melancholy was coming on. His mind began to think of another month by himself and his friends going back to their homes and families. He threw a piece of wood on the fire and sat down with his banjo. He played a couple songs he had learned in Army camps over the years. As the choruses of soldiers and the loved ones they left behind faded he moved on to some hymns. He could not explain it, but music always seem to lift the melancholy. Zeke longed to have a life like that. To have events so dramatic happen to him. To have such tangible evidence that God loved him and was working in his life. Zeke kept reading. “Or stone fortresses”, thought Zeke. He closed his Bible and looked across the river again. In the passage, there were those who were brave in battle and those who died by the sword and both were faithful. God loved them both. Where the people were and what was happening to them was not evidence of God’s love or his withholding of love. Each one had a different path to walk. Zeke took another sip of coffee and watched his breath in the cool morning air. John the Baptist walked a path that led to prison and execution while Peter and John got to walk with Jesus. Peter was told his path would lead to execution and Peter didn’t think that seemed fair. He asked what was to happen to John, James’ brother. Jesus told him not to worry about that. Peter had his own path to walk and John another. John would be tortured, endure failed executions and die on a rock in the middle of the sea. Zeke took another swallow of coffee. This was his Patmos. He wasn’t being punished, this was just the path he had to walk. He longed to have a home across the river, maybe a wife and children. Maybe that would happen but if it didn’t, he still wanted to live like the people in that passage. Faithful regardless the circumstances. I got the idea for this story while touring Fort Knox near Bucksport, Maine. For many years, there was someone living in the fort alone. After learning about Leopold Hegyi, I started thinking about what it would be like to live in that place separated from civilization.